TrexPro® Platinum is the highest level of recognition available for an independent contractor. 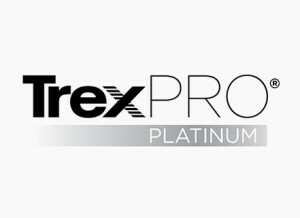 TrexPro® Platinum deck builders are the leading TrexPros in their markets, with demonstrated ability and expertise to design and build outdoor living projects with Trex, ranging from the simple to the most complex. Look for the TrexPro Platinum icon when you’re searching for an official TrexPro® deck builder near your area in Metro Detroit, Michigan. There are hundreds choices of alternative decking products and on top of that most manufacturers have several product lines so which one is right for me? A final reason to consider composite decks is their dependability for many years. Most composite deck products have an excellent warranty because the products used are so reliable. In fact, TimberTech’s and Trex’s 25-year warranty can even be transferred to a new owner, which is an excellent advantage for resale value.